Brazilian Jiu-Jitsu (BJJ) is a martial art focused on grappling and implementation of ground fighting techniques, holds, chokes, and locks to submit your opponent. A favourite of mixed martial artists competing in the Ultimate Fighting Championships (UFC), BJJ is one of the core disciplines in modern Mixed Martial Arts (MMA) training. Centred on grappling, BJJ promotes the concept that smaller, less athletic fighters can successfully train with and compete against larger and stronger opponent. 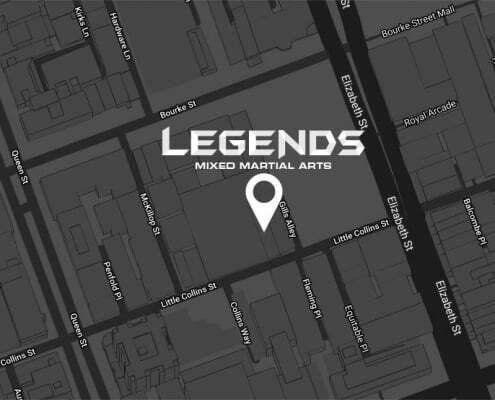 Centrally located in Melbourne CBD and led by black-belt David Younan, Legends MMA offers BJJ classes in both Gi and No-Gi configurations. Through rigorous training under Professor Ninos Dammo of the Australian Elite Team – the #1 Brazilian Jiu-Jitsu (BJJ) team in Australia, David Younan earned his Black Belt in BJJ, and is now the Owner and Head BJJ trainer at Legends MMA. David has fought across Australia and the world and won or placed in several international competitions including: Australian and State Championships, Pan Pacific Championships, World Abu Dhabi Pro Australia, Boasuper8, BJJ Pro (IBJJF), European Open, Asian Open, Rio International Open, Oceanic Gi Championships (Events BJJ), and the Rome International Open. Through his extensive experience and knowledge of BJJ, he has trained and continues to train some of Australia’s greatest competitors to victories across the World. Our Brazilian Jiu-Jitsu classes start off with light stretching and warm-ups designed to loosen your muscles to prevent injury and improve flexibility. Basic BJJ movements essential to the sport are an important part of improving your skills and warming your body up. For new members who haven’t trained in BJJ before this is the perfect time for our trainers to walk you through the basics of the sport. Moving on from the warm-up, students will move onto the “drilling” phase of our training. Drilling is a safe way for members of all levels to practice their abilities repetitively with other students, without the force of “rolling” (BJJ equivalent of sparring) or competing against an opponent. The next step in our program is for David or another trainer to demonstrate a technical skill, with our students then practicing this technique and finessing their abilities. At the end of each session, students who are comfortable have the opportunity to participate in competition rounds, or “rolling”, whereby they can further practice and develop their techniques and abilities with their team mates in a safe and enjoyable way to end the session. Before heading for the showers and change rooms, every member of the group gets the opportunity to shake hands and say thanks to everyone in the training session – a great way to keep our family strong. Is Brazilian Jiu-Jitsu safe for beginners? If this is your first time training in Brazilian Jiu-Jitsu (BJJ) then don’t worry, at Legends MMA one of the first things you will notice when you step into the gym is the friendly vibes! We have beginners come through every day, so you are not alone! No – You do not need to be strong, flexible, or in particularly good shape before you start training in Brazilian Jiu-Jitsu (BJJ). However, after you start training in BJJ consistently you will get in the best shape of your life! What type of people do Brazilian Jiu-Jitsu? Brazilian Jiu-Jitsu (BJJ) at Legends MMA is for everyone – regardless of age, gender and fitness levels. BJJ is a magnet for interesting people. At Legends MMA we have professional athletes, doctors, lawyers, builders, students, finance professionals, marketing executives…the list goes on! BJJ attracts a diverse range of people and so many fascinating minds, it will be impossible to not form some great friendships. What are the health benefits of Brazilian Jiu-Jitsu? Brazilian Jiu-Jitsu (BJJ) is an intense, fast paced workout and one of the rare sports which is considered to be both anaerobic (promotes strength, speed, flexibility and power) and aerobic (improves cardio, blood flow and oxygen circulation in your body) – therefore Brazilian Jiu-Jitsu is the ultimate form of exercise and functional fitness for anyone who wants to become leaner, more toned or lose weight. BJJ is considered to be anaerobic because during grappling you use “bursts” of energy with several different muscle groups when you perform a technique to submit your opponent. The aerobic component from BJJ comes from the fact that during rolling there is a continuous sustained effort exerted by your cardiovascular system. If you want to improve your health and overall athletic ability, then BJJ is a must! Ready to start? 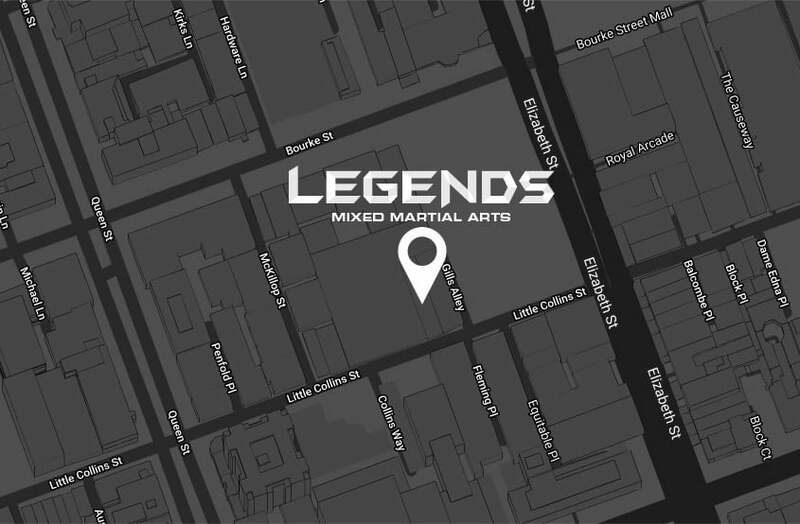 Get your first session at Legends MMA for FREE!